"This sport has something for everybody - from the super fit athlete to the newbie on water." Stand up paddling, the world’s fastest growing water sport, has officially arrived at Lake Powell, with leading fitness trainer and adventure guide Melanie Webb of Sol Fitness Adventures becoming one of the first certified instructors – the only one who is a nationally certified Personal Trainer – in the northern Arizona / southern Utah region. The three unique SUP offerings are the products of Webb’s combined 4 years of stand up paddle experience and 12+ years as a fitness trainer and adventure guide. “I was hooked the first time I tried SUP, back in 2009 on the Potomac River in Maryland. This sport has something for everybody - from the super fit athlete to the newbie on water. The combination of balance and core exercise is an awesome workout, and being on the water, whether it’s the majestic redrock cliffs of Lake Powell or Santa Barbara’s Pacific Coastline, is an incredibly calming, ‘Zen’ experience.” Webb’s SUP Core Fitness fuses Pilates floor and Yoga exercises with the board on water; SUP Pranayama captures the essence of the calming effects of water in a paddle session with breathing meditations; and SUP Lessons teaches the basic strokes. An innovator in the adventure travel industry, Webb is passionate about connecting travelers to their bodies and Mother Nature through exercise and mindfulness work. 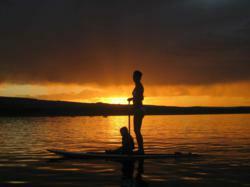 SUP is an additional tool to help people ‘unplug’ and is for all ages and fitness levels. With a wide array of SUP connections spanning both the East and West Coasts, Webb is an ambassador for Carbonerro paddles and looks forward to contributing to the growth of the fledgling SUP industry in a positive and professional way. A recreational stand up paddler of 4 years, Webb received her Academy of Standup Paddleboard Instruction (ASI) Instructor Certification in Newport Beach after attending a course taught by the World Stand Up Paddleboard Association (WSUPA). The ASI instructor certification is a requirement of the U.S. National Park Service, the government agency that manages Lake Powell and oversees Commercial Use Authorizations (CUA’s), and recently created a stand up paddle CUA at Webb’s request. Webb expects to complete the Park Service’s CUA application procedures and be in operation by May 2012. Interested travelers are invited to keep an eye on the Sol Fitness Adventure’s website for updates and registration information and note that SUP boards and paddles will not be available for rent. Webb is an ATHLETA Featured Athlete for 2012 and is Assistant Editor of Exercise & Fitness at AllThingsHealing.com. A Certified Personal Trainer with the American Council on Exercise, Webb’s expertise has been featured on Good Morning America and FOX Local News in Washington, D.C. and in Appalachian Mountain Club, Cosmo Girl, C A R S O N, Mammoth Sierra Magazine, 805 Living, Outside Magazine, Real Simple, Weight Watchers, and DC Style magazines. Educated at Brigham Young University, Webb has led multi-day fitness adventures throughout the Western United States, in Whistler, Canada, and Machu Picchu, Peru. Webb's Sol Fitness Adventures is a member of the Adventure Travel Trade Association.